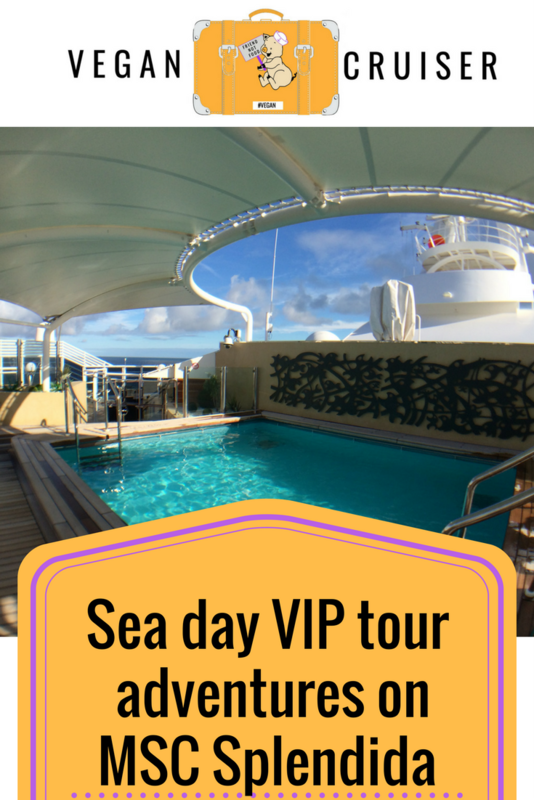 The first sea day morning onboard was tough as we had an early MSC Splendida tour scheduled for us. Imagine getting up at 7am on a cruise ship! Usually, I’m in the nightclub dancing the night away if I know I have a sea day ahead. But not on this trip as we had places to see. 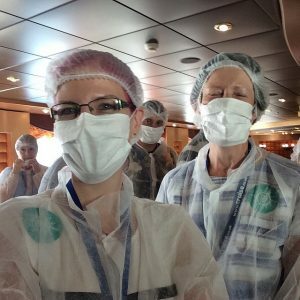 Our group of competition winners had kindly been gifted a ‘Behind the Scenes ship VIP excursion’ to get some glimpses into how the magic happens. And we weren’t going to miss it – even if it meant setting up an alarm on a sea day. Our time on Splendida was going to be different as we had to cram in as much as we could in our three days. No staying up after late dinner – instead, my friend and I retired to our gorgeous cabin for well-earned sleep (see the last post for cabin photos). We had already had an early start for the day in London and we were travel-fatigued so sleep was well received. While most of the ship were still in the land of nod, our group gathered 8.30am at the designated meeting point. This was the Strand theatre, a large modern 1600 seater show-lounge that spans two decks. We were split into two groups and started our tour of this modern venue, our group getting to start with the stage itself and the backstage dressing rooms. 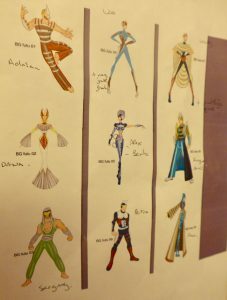 The extravagant shows produced and performed each night require a lot of outfits so in addition to the changing rooms we were shown storage for all the weird and wonderful props used. 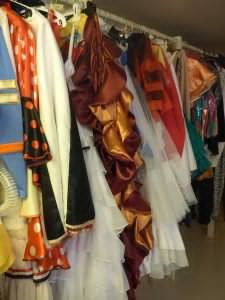 My two favourites were the carousel horses which were on stage already (the other to follow – see photos). So many weird and wonderful pieces of clothing & equipment… and the ‘extra boys’ in boxes was my personal theatre favourite of all – followed by the gorgeous horses. After seeing where the performers get ready, we made our way to the sound & lighting booth at the top of the theatre to see all the tech that is needed to produce the shows. I had not really thought how much kit is needed: for the stage, lights and for the audio the performers require – let alone a dedicated tech crew. The walk up made it seem like there’s hardly a bad seat in the house, views of the stage seemed good all round. I took this last photo as we were heading out: you can see staff getting ready to do another muster drill for those who thought they could skip it on the first day. After the theatre tour, we headed some decks below to the crew quarter. As we entered the non-passenger space we were kindly asked not to take photos. I’ll try to paint a few pictures in words instead. 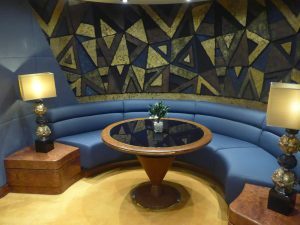 The difference between the two areas was stark: from the opulence of the passenger side to the simple and clean minimalism in crew corridors. We were taken down a series of deep steps to the laundry department – which was fascinating, actually. I had not really considered what it takes to keep a ship this size and all its venues and cabins in clean linen. What we found was a large 24/7 laundry full of various facilities for linens & towels, laundry & dry cleaning service for passenger clothing and crew/staff uniforms. I have generally been the type to a reuse my towel at least once. Witnessing the hard work these guys carry out around the clock certainly gave me an appreciation for the heavy work they do. It strengthened my resolve to be environmentally-minded and re-use my towels onboard. Bed linen in this laundry was processed in a massive piece of equipment that resembled a newspaper printer. The wet, washed sheets travelled through it and in the end, it spat out a flat, dried, ironed and folded pieces of linen. Us ladies were rather impressed – we all wanted one for our homes. Mind you, we would need another home to house the machine itself due to its size. The crew corridors were full of notices of various kinds, anything from staff instructions (proper uniform and presentation in passenger areas) to reminders of recycling facilities onboard. These were pointed out to us by our guides who briefly spoke about the various green initiatives that have won MSC prestigious Eco-ship awards & certificates. I would’ve had loads of questions on this but I couldn’t really keep our tour back. Hopefully one day I get to speak to an environmental officer aboard a ship to learn about ways of reducing the waste disposed. 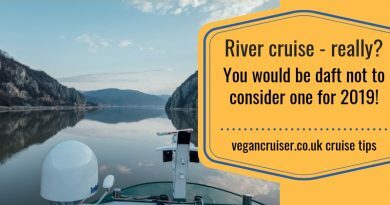 (see an earlier blog post on the environmental effect of cruising). From the laundry, we made it up a few decks into the main dining room. 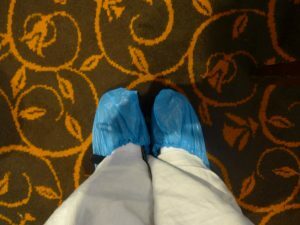 There our group got kitted in protective gear to visit the galley (kitchen) and stores. Much hilarity ensued but donning a mask, hat and other gear was a bit too much like work for me. Still took a silly selfie before entering the kitchen-side though. We were taken through various storage areas and explained about stock rotation, food storage and hygiene (such as having separate lifts for food transport only). I was excited to see a shelf full of tofu thinking I might be able to find interesting meat-free Asian food in the restaurants. I also noted how the breakfast cereals on this sailing were all German so less likely to be fortified than their UK counterparts. I did not dare pull out a box from stock to see actual ingredients to check whether they were vegan, but I am hopeful. We were moving on too quick for me to take a sneaky photo. From the stores, we moved on to a tour of the vast kitchens. It was interesting to see the day’s menu items on A4 sheets hanging in the galley with notice of ingredients/building blocks of which they consisted. Could see immediately that the vegetable tempura was going to be one of the vegan courses served on that night’s dinner. Sorted. We were shown the in-house bakery with its proving cabinets and ovens (the bread baked onboard by the German master baker and his team was SO good). Their patisserie items could be obtained all over the ship too – unfortunately, none of it was vegan. At the end of our kitchen tour, we were taken to the butchery kitchen without any advance warning or option to skip this part of the tour. The stench of raw meat made me feel ill but my vegetarian tour companions (20+ years of living meat-free) were turning visibly green behind me. Hearing about the high hygiene standards and decontamination of knives was an interesting fact to learn but I could’ve done without the olfactory attack. We tried to stay back in the corridor to avoid the room altogether but there was no escaping of the smell. Thankfully we were able to make our exit into the crew corridor soon after. 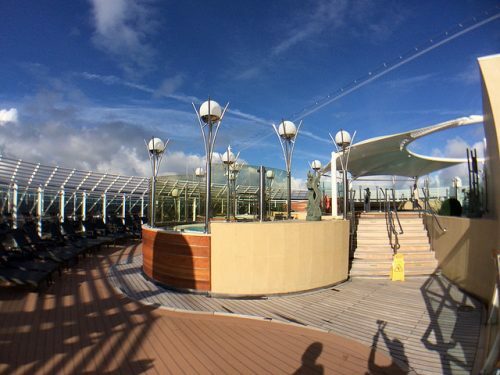 From the galley, we escaped to the top deck and sought fresh air. 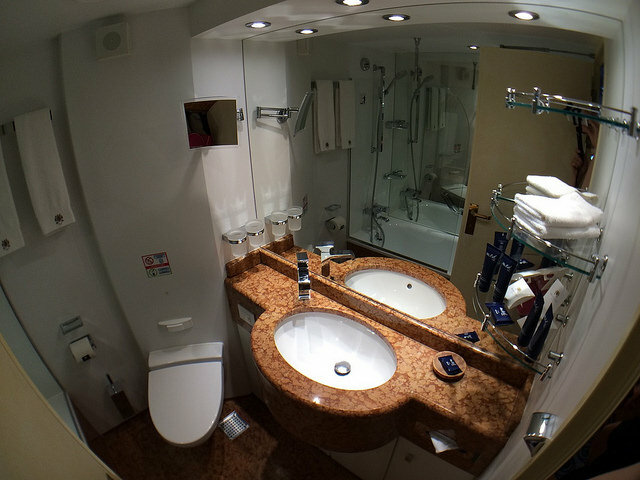 We were treated to a quick look at the exquisite, all-inclusive ‘ship on a ship’ Yacht Club complex of private suites with accompanying services. The Yacht Club (YC) comes with 24h butler service, its own concierge and private pool deck and restaurants – even priority access to lifts outside the Yacht Club, giving speedier access to other decks. Not to mention priority boarding, disembarkation and excursion access off the ship. 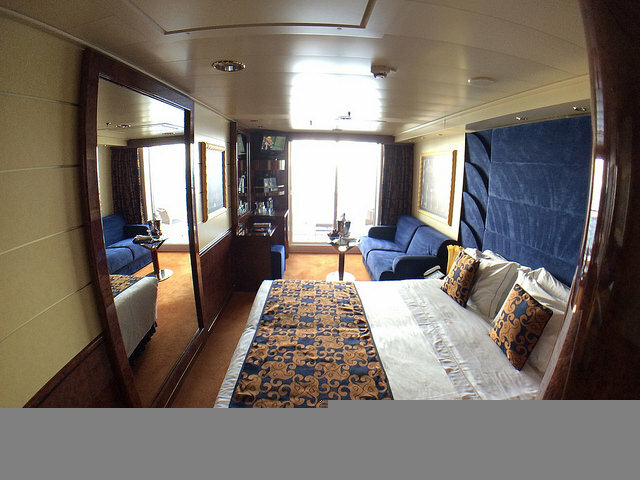 We were able to visit one of the smaller Yacht Club suites that was unoccupied on this sailing. 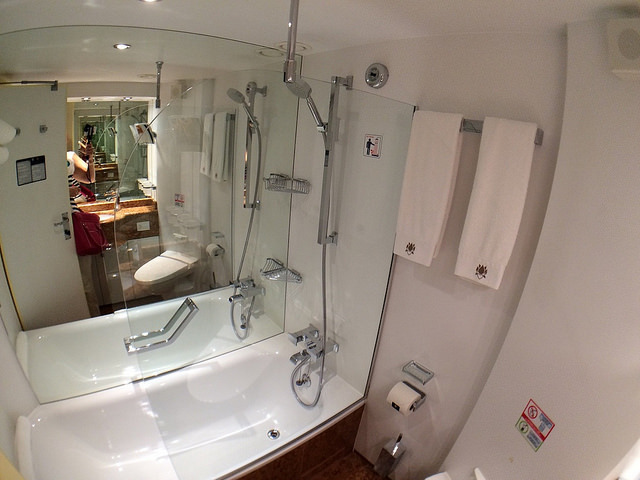 This suite was similar in style and shape to our balcony cabin but larger, with a walk-in wardrobe area and more spacious bathroom with an actual tub. Suites come with better bedding & fittings and all the other service extras included – plus a larger balcony to enjoy. 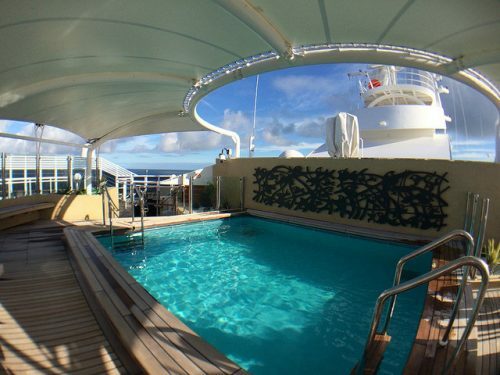 I wouldn’t spend too much time in my suite though, I would be up one deck at The One Pool or the Top Sail – if not my own balcony enjoying the sun. The One Pool above looks like beautiful haven on a sunny day – though during our visit it was empty, probably due to the early tour and the windy weather outside. The private pool deck houses an exclusive pool, two jacuzzis and a bar for Yacht Club customers – one I could imagine myself enjoying a drink on. 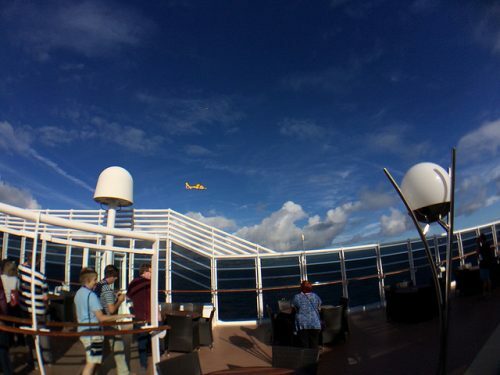 We even were even treated to a 360-degree fly-over by a yellow rescue chopper as we sailed on towards France – just a coincidence, I know, but if was entertaining regardless. After our tour, my friend and I went to the lovely Bora Bora buffet for food. After lunch it was time for our presentation by MSC UK team – an interesting and informative session about new ships coming out in 2017/2018 and the new private island marine reserve opening in the Bahamas in a few years time – all rather exciting. Team that with a cruise calling in at Cuba? Post-presentation we had the afternoon to ourselves to chill after a busy morning. 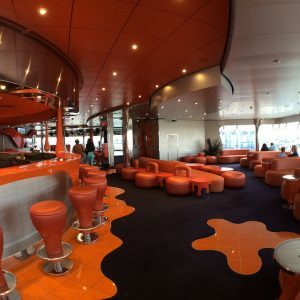 My friend and I ended up in the gorgeously pink Aft Lounge with the best view onboard. 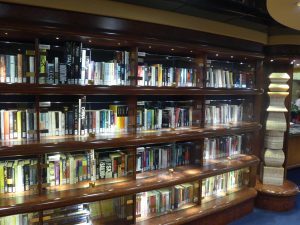 Plus it had the best selection of music I’ve ever come across on a ship! 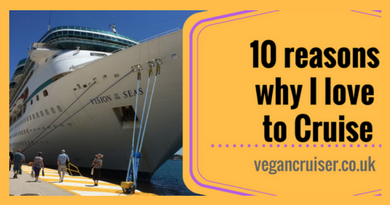 Indie isn’t often heard on cruise ships. Getting a range of indie rock and pop from 80’s to current day was a refreshing change from the usual cruise mainstream Lido music or lounge music cliches. Respect, MSC! The lounge itself has lots of pink and brown swirling sofas, pebble stools and tables, quirky & comfortable chairs and stone-like walls that give it a cave-like feel. So difficult to explain but perhaps this Youtube video will show you what I mean. I particularly loved how the chairs matched both my handbag and my hair  Nice touch! 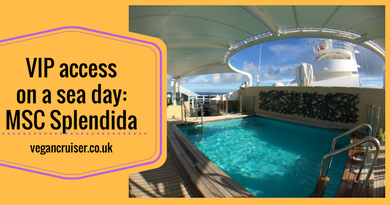 I had been impressed by Splendida from our arrival and our 2nd day onboard certainly did not change that view, just reinforced it. Such great behind the scenes excursion to have and would now definitely consider one on another ship. Check with your cruise excursion desk! 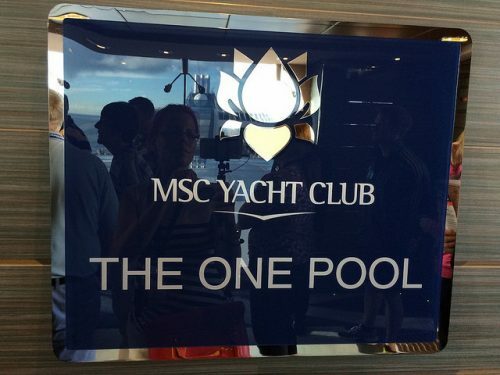 Even if the online cruise personaliser doesn’t list a behind the scenes tour for your sailing, one may still be available on a sea day once you’re onboard. 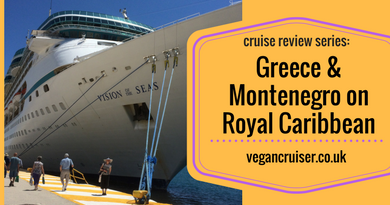 Our evening dining is discussed in another post altogether – Can you eat vegan on MSC? Thank you for reading – any questions or comments? Would love to hear from you! 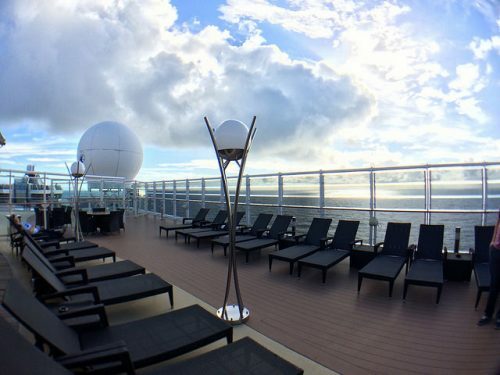 Omgsh what an amazing cruise! I seriously want to go on a cruise so bad! Love all your photos! The whole concept of your blog is amazing! 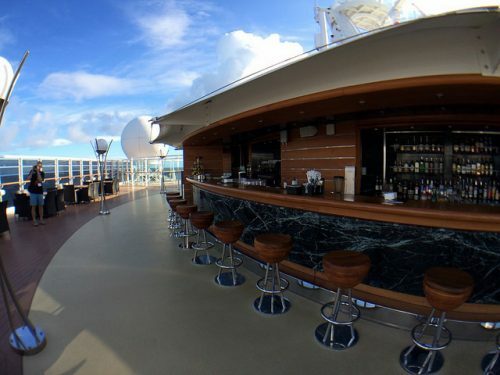 This cruise looks equally as amazing! Looks like you had an epic time! Definitely more excited to cruise on the Splendida in April 2017! Love reading your blog, Sanna!